I was out feeding bees today on my day off. I have about 15 hives from the first delivery of packages. I have not looked at them in a while. All of the hive looked great. I had 5 to 6 frames of brood in various stages (eggs, larvae and capped). 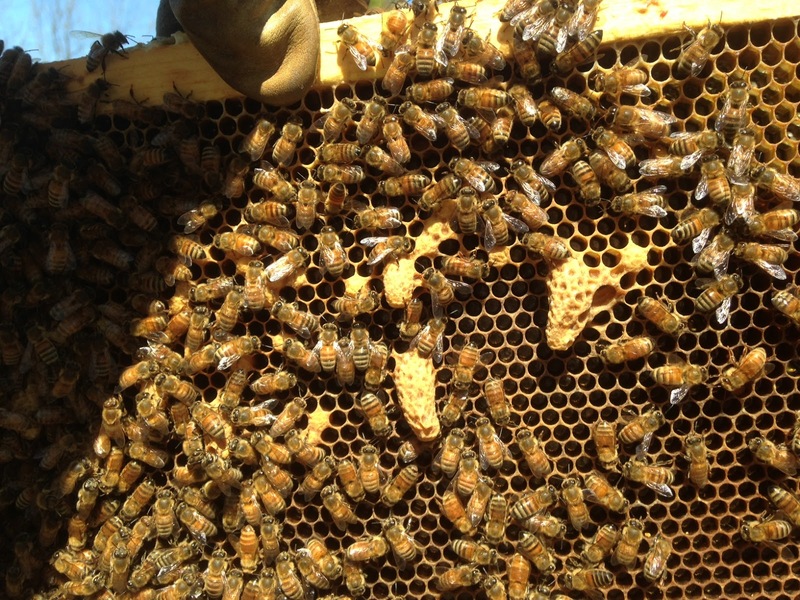 The bees were pretty much covering the top bars on all frames. 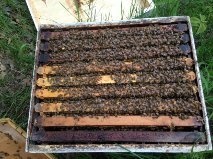 The picture above is a very nice single box with bees covering 8 frames. Time to add another box to give them room to increase the brood nest. The cool weather we have had has made it a little more difficult for the bees to expand the brood nest. This upcoming week has temps in the 70's and lo 80's. This will greatly help the bees. Looked at some other colonies of mine from the second delivery of packages. They were doing great and should be ready for their second box in about 5 days. I went over to a neighbors bee yard to look at his bees. He is new this year and wanted to make sure everything was working. I smoked the entrance, lifted the cover, smoked underneath it, removed the cover, smoked the inner cover hole, lifted the inner cover and smoked underneath that. This is how I enter a hive. Jim: Where is the feeder? new beekeeper: I thought I was done feeding. Jim: When drawing foundation on new colonies you need to feed syrup from the time you put the bees in until the first of July or until the foundation is all drawn out, whichever comes first. New beekeeper hives were on the second delivery. 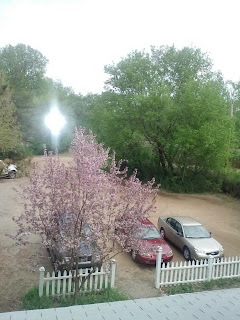 His beeyard was very nice, the hives had a custom copper roof that he had built. I looked at his frames that he put together and they looked well constructed. 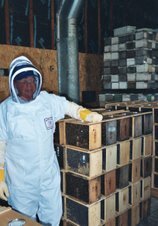 The hives were set back a little by not feeding and they had not expanded their brood nest because the bees could not make beeswax without the syrup. One hive was doing ok the second hive was a little better but with some syrup they both should be ready for another box in about 10 days. A little more time and I could tell that they will perk right up. Open again Tues the 28th 5 -7. 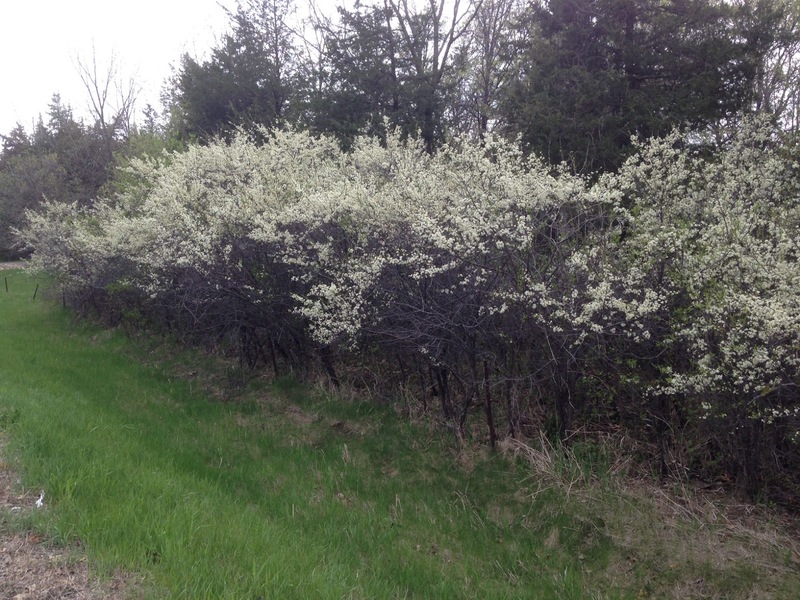 The fruit bloom has started. 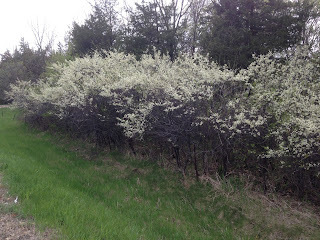 The first to bloom around my area are the wild plum trees. They smell wonderful and the bees love the pollen. Flowering crabs are blooming also, I think apple trees around me are a week out for flowering. 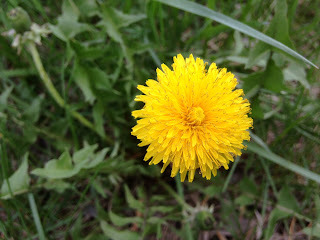 Dandelions have finally appeared on my lawn. About three weeks later than normal. There will be a great variety of pollen coming in now but after June 1st there may be a dearth of pollen for a couple weeks. Pollen patties may be needed at that time. I had the Scarlet Tanager in my bird bath earlier in the week. I have never seen one before live and in color. Thought I would share the pic. 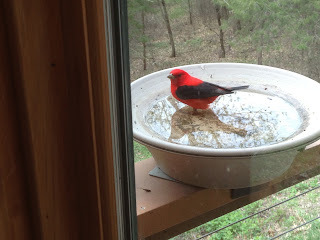 I have also seen but no pics yet, indigo bunting, orioles, humming birds. The package bees are here and I will start passing them out starting at 8:30 am Friday. This is what emergency queen cells look like. They could also be called supersedure cells. 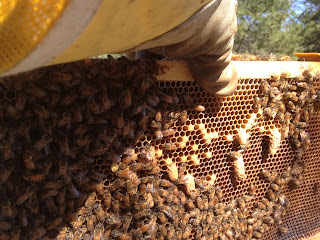 They are located across a frame with the bees desperate too get a new queen. This was one of my packages that went queenless for some reason. You can see two queen cells look ok the others are puny and would be a very poor queen. Being with this weather we have had. If a queen would have emerged the odds of here getting mated properly would be very low. The cold spring has left very few drones to be had in the hives. It may be mid June before there will be sufficient drones to get a queen properly mated. I did squash the cells and installed a new queen. The supersedure queen cells are the elongated cells hanging on the side of the frame. Two look about the right size for a queen, the others are small and would not turn into a good queen. During the 60's the book called "The Silent Spring" was published. The author Rachel Carson talked about DDT and other chemicals in the environment and how the pesticides were being distributed around the world. The American Bald Eagle is the symbol of the DDT fallout. The DDT was making their egg shells thin and the Eagles' eggs were breaking in the nests, their reproduction was dramatically affected by DDT. When I was growing up in the 60's to see an eagle was a huge event. Since the ban of DDT in 1972, eagles have made a huge come back, and now I see an eagle several times a week. The Silent Spring has a line from a John Keats poem "The sedge is wither'd by the lake, and no birds sing." A compelling quote if you substitute bees for birds. The author talks of how we as cohabitants of the planet, that we share with all living things. That we can't control the planet to our own exclusive control. Something will break and it is the human race that ultimately will pay the price for this attitude. The Silent Spring helped launch the conservation movement. Is this same pesticide event now happening to bees and to all pollinators? Is American agriculture creating the silent hive? My readers should stay informed about this issue and draw their own conclusions. A good commentary in the StarTribune about this very issue is worth the read.